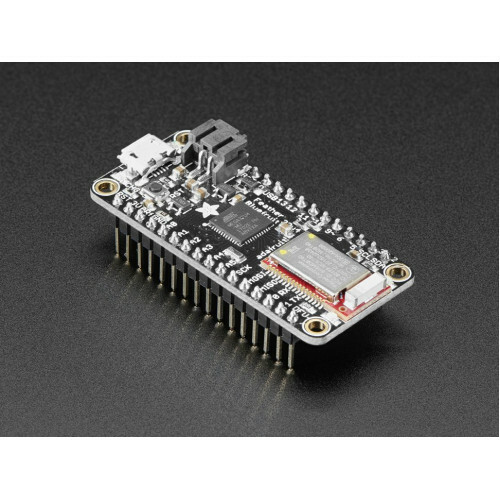 This is the Adafruit Feather 32u4 Bluefruit with Headers - our take on an 'all-in-one' Arduino-compatible + Bluetooth Low Energy with built in USB and battery charging. Its an Adafruit Feather 32u4 with a BTLE module, ready to rock! We have other boards in the Feather family, check'em out here. For the Feather 32u4 without pre-soldered headers, check out this link. Bluetooth Low Energy is the hottest new low-power, 2.4GHz spectrum wireless protocol. In particular, its the only wireless protocol that you can use with iOS without needing special certification and it's supported by all modern smart phones. This makes it excellent for use in portable projects that will make use of an iOS or Android phone or tablet. It also is supported in Mac OS X and Windows 8+. The Feather 32u4 Bluefruit LE uses the extra space left over to add our excellent Bluefruit BTLE module + two status indicator LEDs. 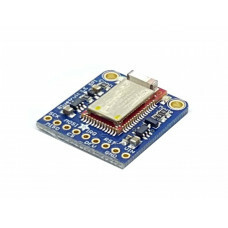 The Bluefruit LE module is an nRF51822 chipset from Nordic, programmed with multi-function code that can do quite a lot! For most people, they'll be very happy to use the standard Nordic UART RX/TX connection profile. In this profile, the Bluefruit acts as a data pipe, that can 'transparently' transmit back and forth from your iOS or Android device. You can use our iOS App or Android App, or write your own to communicate with the UART service. The board is capable of much more than just sending strings over the air! Thanks to an easy to learn AT command set, you have full control over how the device behaves, including the ability to define and manipulate your own GATT Services and Characteristics, or change the way that the device advertises itself for other Bluetooth Low Energy devices to see. You can also use the AT commands to query the die temperature, check the battery voltage, and more, check the connection RSSI or MAC address, and tons more. Really, way too long to list here! You can do a lot more too! Turn it into a UriBeacon, the Google standard for Bluetooth LE beacons. Just power it and the 'Friend will bleep out a URL to any nearby devices with the UriBeacon app installed. Built in over-the-air bootloading capability so we can keep you updated with the hottest new firmware. Use any Android or iOS device to get updates and install them. This will update the native code on the BLE module, to add new wireless capabilities, not program the ATmega chip. 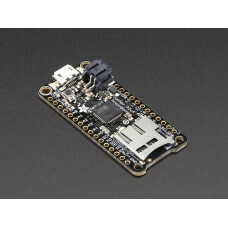 Product Dimensions: 51.3mm x 23.0mm x 16.0mm / 2.0" x 0.9" x 0.6"
Feather 32u4 Adalogger Adafruit. Feather is the new development board from Adafruit, and like its na..
Feather 32u4 Bluefruit LE Adafruit is the new development board from Adafruit, and like its namesake..